Someone had the audacity to tell me that July 4th is on Sunday. I thought they were pulling my leg, but guess what? It is on Sunday! Can you believe it? Where did June go? I thought I would just post some links to some past favorites I had for the 4th of July. I hope you enjoy them: if you haven't seen them before. Here is a fun rocket that gets a great reaction when it blasts off! The post Bursting into July 4th has a few fun ideas. 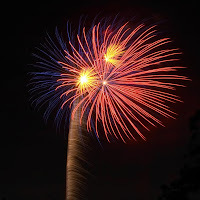 Fabulous Fireworks are included in the post listed above, but they are always a big hit. I've missed your blog (took a break from the blogging world). But I'm back!! Happy 4th! Hope you enjoyed your 4th! I had to work, but the kids enjoyed cookouts, swimming, and fireworks with Dad and friends! Thanks for stopping over at my blog- I responded to your comment under my reading post. Take Care!